My mom was surprised I didn't want to save my My Little Pony palace or Strawberry Shortcake toys; I told her she could sell them on Ebay if she wanted, but I honestly don't have room for them in our under 1,000 sq ft NYC apartment. 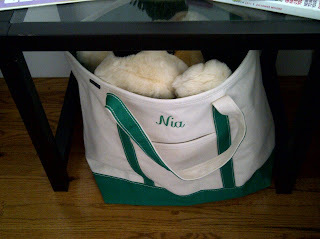 I got carried away last week and actually put Nia in her bag! What are your favorite childhood toys? Have you saved any for your kids to play with someday? 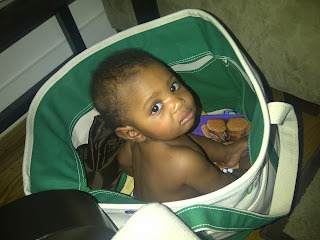 I have no toys saved at all and neither does The Mister. I don't know what happened to all that stuff but my parents moved from our childhood home so I'm sure they purged it then. The Mister is saving a bunch of Star Wars figurines and a Superman collectible for Lewis now. He purchased these as collectibles though so they aren't his own. That list from the 80s takes me way back. Pound Puppies, Koosh Balls and the Snoopy Snow-Cone Machine! My sister and I had Chubbles and Chiggles whos eyes lit up when you clapped. My sister also had Cricket who "talked" through a tape in her back. Along with the food making toys, I had one called Buzzy the Cookie Maker or something like that. It was a teddy bear where you sawed graham crackers into shapes and then decorated them with icing. I saved mostly books. My whole collection of Berenstein Bears books from my youth I still have and get to read to my kids. Now true, most of them are torn up and probably wont last until their teenage years but I will enjoy it while it lasts. Jacks! I forgot all aobut them. My favorite toy and I'm not sure if it qualifies as a toy would be my double dutch rope and my hula hoop. Unfortunately I don't have any that were saved. Oh gosh, what a blast from the past! I think I had every toy on that list except for Pound Puppies. Funny you are posting about this now because my parents are also going through all the stuff in their basement and purging. Now that J and I have a house of our own my parents want me to take what's mine. 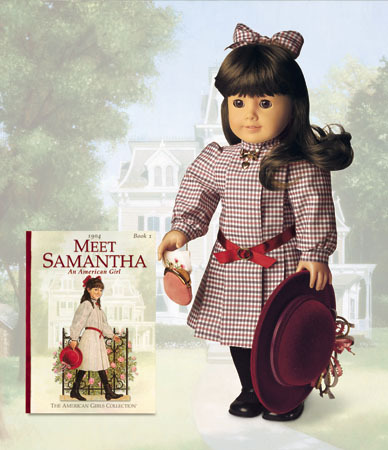 I can't believe they discontinued Samantha! I think that was the first doll I got. My parents saved them and all and the books I collected too. I took a bunch of my childhood books a few weeks ago and need to go back to get my dolls. I told my parents they could throw away all the Barbies (they had seen much better days), but keep the Porche and Jeep! They don't make toys like they used to. I still have my CareBear and Cabbage Patch Kid too. Thank you everyone for sharing your memories! @Keyalus -Ahhhh the Snoopy Snow Cone Machine! I was never a fan of snow cones, but remember seeing this I think in the JC Penney Christmas catalog year after year. I used to drool over that catalog! @K.Rock - I LOVED Berenstain Bears too! Nia received a couple of those books and I can't wait to read them to her. I still remember the one about learning to ride a bike, it cracked me up as a kid! Also, the one about strangers scared me when Sister Bear imagined the unfriendly world and everyone was frowning and looking mean - even the owls. @Mimi - I sadly never learned to double dutch but would love for Nia to learn. At least I can show her how to hula hoop and play jacks! @Sarah - That's awesome you still have your CareBear and Cabbage Patch Kid. I still remember the name of mine: Cheri Annabelle. My mom saved her Barbies from the 60s and I used to play with them! Not sure if she still has them. I don't plan on giving Barbies to Nia, but we'll see how that plan goes!